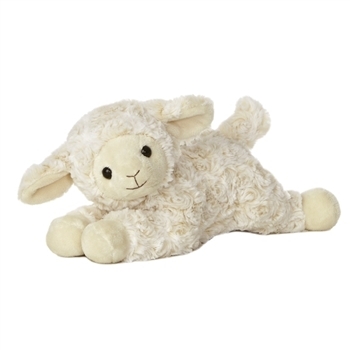 Our precious Sweet Cream the Musical Lamb Stuffed Animal by Aurora is ready to sing you a lullaby! Measuring 12 inches long, this musical stuffed lamb is made from luxuriously soft and curly plush material. A turn of the wind up key on the back of our musical plush lamb plays the tune 'Jesus Loves Me'. A cocked head and smiling face give Sweet Cream the Musical Lamb Stuffed Animal a charming and delightful expression that while provide countless hours of enjoyment. A member of the Aurora family, Sweet Cream the Musical Lamb Stuffed Animal is made from high quality child safe materials and meets or exceeds all U.S. safety standards. Recommended for ages 3 and up, our musical plush lamb is surface washable. Lamb is soft. Music is sweet. Happy with product. We gave this to our great niece along with a check on her Christening Day. We included the personalized bandana that says "Jesus loves Claire." We were extremely pleased when we received it . Such a sweet gift!